Look carefully at a bare, brown field, especially in winter, and you may be surprised to see it crawling with little brown shapes. When they turn, you may see a neat yellow face, black mask, and tiny black “horns” waving in the breeze. 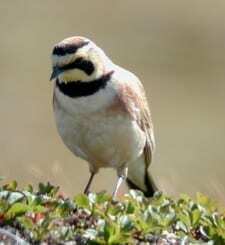 Horned Larks are widespread songbirds of fields, deserts, and tundra, where they forage for seeds and insects, and sing a high, tinkling song. Though they are still common, they have undergone a sharp decline in the last half-century.